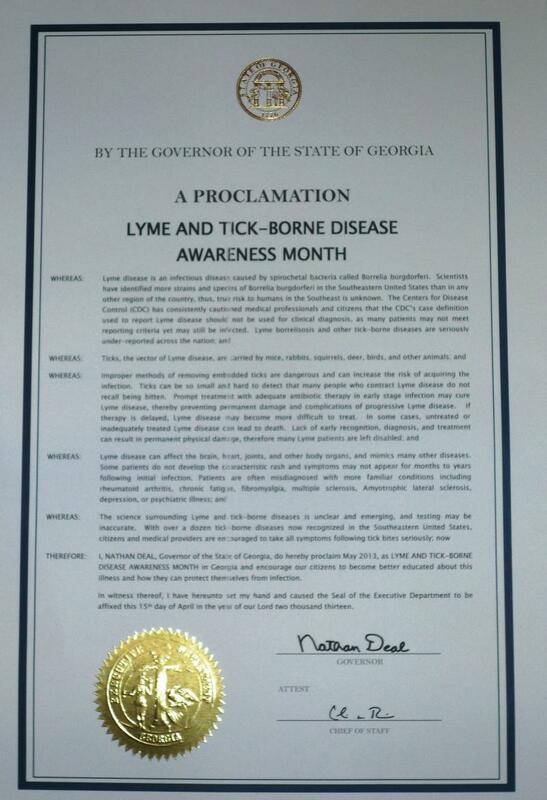 Once again, we're pleased to announce that Georgia Governor Nathan Deal issued a statewide proclamation declaring the month of May, Lyme and Tick-Borne Disease Awareness Month, by request of Georgia Lyme Disease Association. This is the 4th consecutive year the State of Georgia has participated in promoting tick-borne disease awareness month! We're grateful to Governor Deal for being one of the most conscientious governors in the nation in his efforts to protect the public from these serious illnesses. Georgia Lyme Disease Association teamed up with CBS Outdoor to bring Lyme and Tick-Borne Disease Awareness to citizens across Atlanta in the form of digital billboards during the entire month of May! Several digital billboards were posted in various locations around Atlanta including I-75/85 north of 14th Street; I-75 near Hwy 5; Piedmont Rd; Windy Hill Road at I-75; Canton Road and more. The first week alone, GALDA's prevention message was projected to reach 1.8 million people! GALDA shouts out a special thank you to the terrific folks at CBS Outdoor Advertising! GALDA volunteer Lyndsay Sweeney created the new Georgia Lyme Disease Association public service announcement posted on Youtube in May. Georgia Lyme Disease - Did You Know? She also uploaded our Georiga Faces of Lyme Disease video which she produced originally to conclude GALDA's 2011 and 2012 Lyme Disease Awareness Month Programs at the Georgia State Capitol. The video was made to remember of all those who suffer needlessly with chronic Lyme disease because they were told "Lyme disease isn't in this region." These patients didn't receive the early treatment that may have successfully cured them and prevented ongoing problems and permanent damage. Regional awareness is EVERYTHING. Thanks for your hard work, Lyndsay! GALDA president Liz Schmitz appeared on CBS Atlanta News with anchor Stephany Fisher to discuss Lyme Disease Awareness Month on Monday, May 6. We thank the station for reminding viewers to take precautions to prevent tick bites! 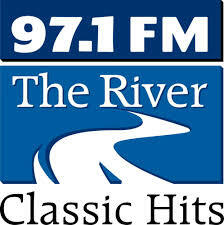 On May 19, Liz was the guest on The River Current show with Rebecca Cheek, on Atlanta's Classic Hits Radio 97.1 The River. Thanks to Rebecca and to morning show host, Kaedy Kiely. Listen to the show below. Listen to the 30-minute interview by clicking on the logo. 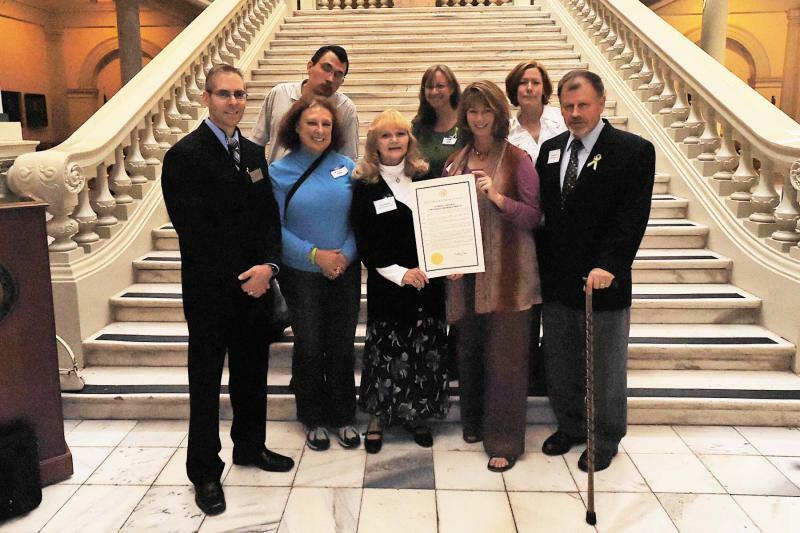 We're so proud of our Georgia volunteers for their efforts to educate others this May! GALDA gives a special shout out to patient advocate Jaime Bloom who spoke during the 3rd annual MayDay Lyme Awareness Rally in Washington, DC on May 25. Jaime shared the difficulties patients face when Lyme isn't recognized outside the Northeastern USA. Thank you, Jaime! 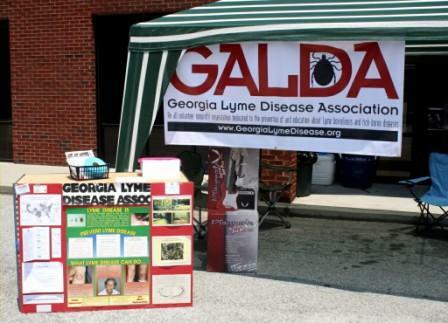 The GALDA volunteers below contacted their local mayors and worked with them to issue proclamations declaring May, Lyme & Tick-Borne Disease Awareness Month in their own Georgia cities and towns. Thank you! Volunteer Mollie Awtrey worked with Mayor Gayle O. 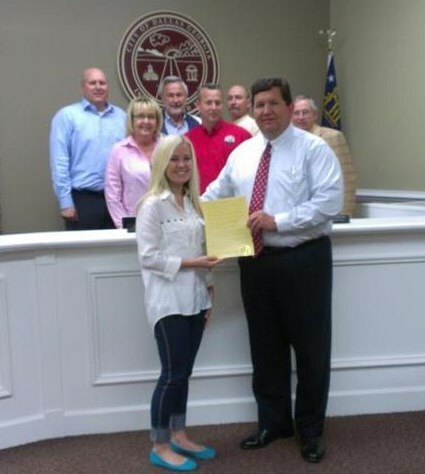 Burden to issue a Lyme awareness proclamation in Meansville, Georgia. 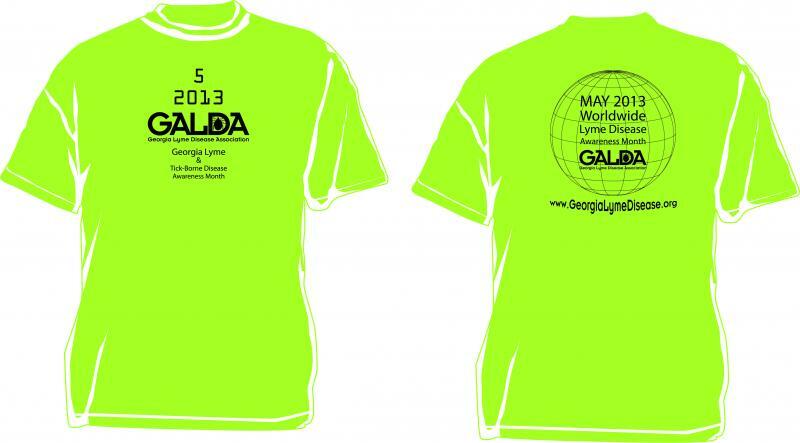 GALDA's first Lyme Disease Awareness Month T-shirt campaign was a big success largely due to volunteer Holly Bryman and the creative crew at ImageFlow Services. We appreciate all the work you put into designing, ordering and shipping the great t-shirts, Holly & ImageFlow! Governor Bob McDonnell signed the Lyme Disease Testing Information Disclosure Act of 2013 into law, making Virginia the first state in the nation to require medical providers to give written disclosure to patients tested for Lyme disease that testing can produce false negatives. Virginia Delegate Barbara Comstock called the legislation a "great step in raising awareness about [Lyme disease] and the high incidence of patients receiving false negative tests." The law goes into effect on July 1. 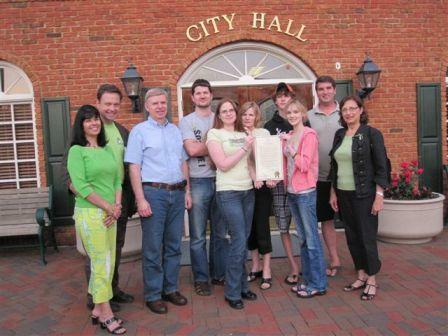 We congratulate NatCapLyme and others in Virginia for their hard work on this legislation. "We demonstrate that ospC genotypes commonly associated with human Lyme disease in endemic European and North American regions were detected in B. burgdorferi strains isolated from non-human biting tick Ixodes affinis and rodent hosts in southeastern U.S.A. We discovered that some ospC alleles previously known only from Europe are widely distributed in the southeastern U.S.A., a finding that confirms the hypothesis of trans-oceanic migration of Borrelia species." "Borrelia burgdorferi sensu stricto ospC alleles associated with human Lyme borreliosis worldwide were detected in non-human biting tick Ixodes affinis and rodent hosts in southeastern U.S.A"
As far back as 1999, Felz et al. at the Medical College of Georgia reported that the Lyme borrelia found in humans in the Southeastern USA were so diverse, the South needs its own Lyme disease testing system. The new AEM paper linked above and many others published since, support Felz's conclusion. In China, when they modified Lyme tests to detect regionally-specific Lyme borrelia strains, the tests became much more sensitive, helping to detect human cases. The question is, why haven't tests to detect these southern Lyme disease strains in humans been developed after all this time? Isn't the health of people living in the Southern USA important? At Georgia Lyme Disease Association, we also believe that the time to revisit the transmission of Lyme borrelia spirochetes by human biting tick species, other than black-legged, Ixodes scapularis ("deer") ticks, is long overdue. This new AEM paper, along with the thousands of anecdotal reports of uncounted human Lyme disease cases spanning decades from the Southern USA, provides even more reason for immediate, thorough investigations. Many Lyme borrelia species now identified were not even known to exist when the last transmission studies using lone star, brown dog and American dog tick species were performed. In those studies, which are now 10 to 15 years old, the scientists only attempted transmission using a few Lyme borrelia strains and a few lab animals. 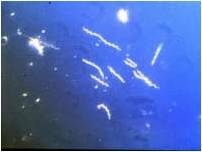 Now we know Lyme borrelia can be found in many different rodents, mammals, reptiles and birds and that more Borrelia burgdorferi species (7) and strains (hundreds) have been found in the Southeastern United States than in any other region of the country. Those old transmission studies can in no way rule out that some of the other hundreds of southern Borrelia burgdorferi strains now identified may be transmitted to humans by the very aggressive lone star tick and/or other tick species. Lyme disease spirochetes have been found in tick species other than Ixodes scapularis or "deer" ticks, including lone star ticks. At GALDA, we have documented cases of lone star ticks transmitting Lyme disease to people (just as reported years ago by Dr. Terry Schulze in New Jersey (1984), Dr. Ed Masters in Missouri (20+ years of research), Dr. Dorothy Feir, and many others). Because lone star ticks are such an aggressive species which bite humans so frequently and the range of this tick is so large, this is a true public health concern that deserves immediate attention. We again call upon our public health officials for help in funding unbiased, independent studies. Twenty+ years is too long for suffering citizens to be ignored. In late July, GALDA president Liz Schmitz was honored to meet Lyme disease researcher Alan MacDonald, M.D. and his terrific wife, Pat. The MacDonalds were traveling through the Southeastern USA and graciously took time out to visit. Tick-Borne Disease Researcher Dr. Kerry Clark is working to identify disease-causing agents in ticks that bite humans in the Southeastern United States. Georgia Lyme Disease Association is working with other Lyme disease groups and organizations in our region to spread the word. If you live in the Southeastern United States and can send in a tick or ticks for testing for research purposes, please download these two forms and follow the procedures listed. (See additional notes below.) By participating, you can help increase our understanding about ticks and tick-borne diseases in our region much more quickly. Thank you! Note: The purpose of the testing is for research. Dr. Clark has limited research funding, so it is important to know that tick testing will prioritize ticks removed from patients, especially patients exhibiting signs or symptoms of possible tickborne disease. Because the testing is currently being offered free of charge, one cannot expect results within a short time period. Identifications can be done and communicated quickly. But, testing for specific tickborne agents could take weeks, months, or even longer. Submitting samples should be done primarily in the interest of research to determine the presence of infection of specific tickborne disease agents in different areas of the southern U.S. Thanks TLS Music for your generous support! 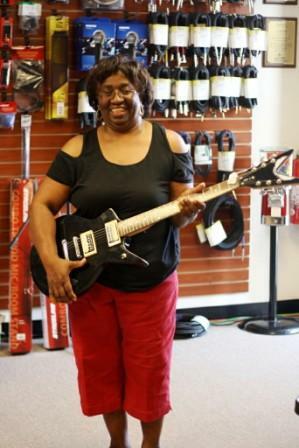 On May 26 during Parkland Plaza’s “May Fest” event, TLS Music of Stockbridge, GA auctioned off two Dean guitars and graciously donated the proceeds to charities. Georgia Lyme Disease Association was lucky enough to be chosen as a recipient! Thank you, TLS Music and owners Thomas and Kely Strader! Our dedicated volunteer Lyndsay Sweeney set up a GALDA Lyme and Tick-Borne Disease information table during the event. Lyndsay distributed our free educational brochures to help spread the word about tick-borne disease prevention. Parkland Plaza’s May Fest was a fun event that included games, a sidewalk sale and live music (courtesy of TLS owners and employees). 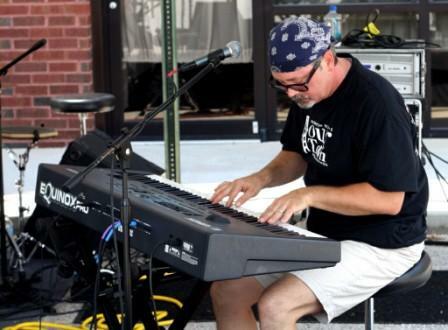 Here are some photos, including one of the happy guitar winner and TLS Music owner Thomas Strader on keyboard. Thanks, again, TLS Music! Thanks, Lyndsay! "Lyme & Tick-Borne Disease Awareness Month"
Governor Nathan Deal again issued a proclamation deeming the month of May, "Lyme and Tick-Borne Disease Awareness Month" across the state of Georgia and urged all citizens to educate themselves about tick-borne diseases and their prevention. New research data confirms the Southeastern United States has infectious Borrelia burgdorferi sensu stricto strains and several other Lyme borrelia species, including the newly-identified Borrelia kurtenbachii, as well as Borrelia bissettii - species that may be human pathogens. Researchers Nataliia Rudenko, Maryna Golovchenko, and Libor Grubhoffer at the Institute of Parasitology of the Czech Republic and James H. Oliver, Jr. at the Institute of Arthropodology and Parasitology at Georgia Southern University presented their findings recently at the 2011 Ticks and Tick-borne Pathogens International Conference in Zaragoza, Spain. For the second consecutive year, GALDA volunteers worked with tick-borne disease researcher Dr. Kerry Clark in field studies to monitor and collect Georgia ticks. You can read the full story by clicking here. The Lyme Disease Awareness program at the Georgia State Capitol on May 5th included presentations by special guest speaker Dr. Kerry Clark, GALDA President Liz Schmitz, and Georgians affected by Lyme disease and other Tick-borne infections. The month of May was declared Lyme Disease Awareness Month in Georgia by a proclamation issued by Governor Sonny Perdue. 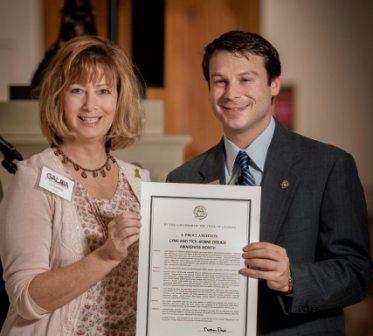 Senator Mitch Seabaugh read the proclamation on May 3rd at the State Capitol during a Lyme Disease Awareness event organized by the Georgia Lyme Disease Association and Representative Matt Ramsey. Georgia Lyme patients and their family members and friends gathered to share their stories to increase tick-borne disease awareness in our state. For a complete recap of the event, click HERE. Special thanks to Governor Sonny Perdue, Representative Matt Ramsey, Senator Johnny Isakson, Jason Skipper, Senator Mitch Seabaugh, Sharon Wilder, Nancy Negris, and Dr. Alan Smith. 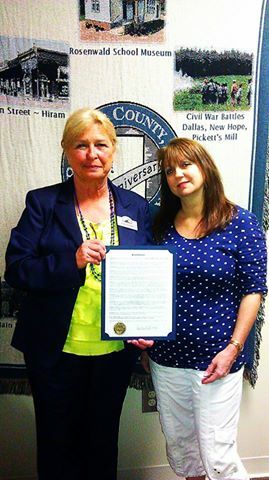 We are grateful to Georgia Lyme volunteer Windy Blair for leading the Lyme Awareness Month campaign efforts across our state. Addressing Lyme and Tick-borne disease issues at the Georgia State Capitol during May's Lyme Awareness Month event. 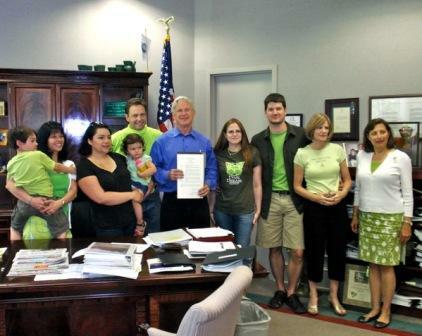 With the help of some hard-working volunteers, several cities and towns across Georgia also proclaimed May Lyme Disease Awareness Month. These included Alpharetta, Roswell, Kennesaw, Peachtree City, Fayetteville, Conyers, Smyrna and Norcross. 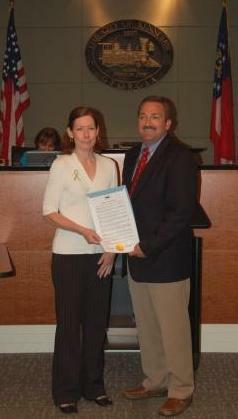 Jackie Morgan accepts the Lyme Disease Awareness Month proclamation from Kennesaw Mayor Mark Matthews. Jackie and husband, Norman, were on hand at the May 3rd City Council meeting. Volunteers Sue Lange, D. Wolfgang, Karl Jahn, Doug Easterly, Heidi Jahn, Jenny Jahn, Mark Ashworth, Chelsea Ashworth, Tom Ashworth, and Minette Johnson display the proclamation outside Alpharetta's City Hall. 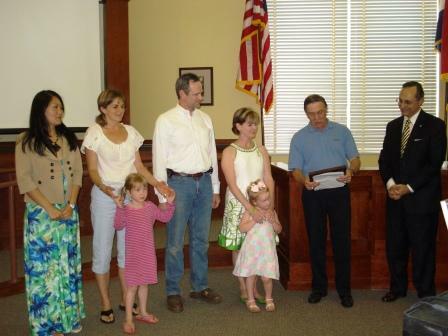 Alpharetta Mayor Arthur Letchas reads the Lyme Disease proclamation on May 3rd before Minette Johnson, Karl Jahn, Jenny Jahn, Chelsea Ashworth, Mark Ashworth, Sue Lange, Heidi Jahn, and Doug Easterly. Georgia Lyme volunteers Seanie Zappendorf, Stephania Bass, and Peter and Windy Blair look on while Fayetteville Mayor Pro-Tem Al Hovey-King reads the city proclamation on May 6th. After presenting the proclamation, Peachtree City Mayor Don Haddix graciously gives Liz Schmitz the opportunity to speak about Lyme disease. 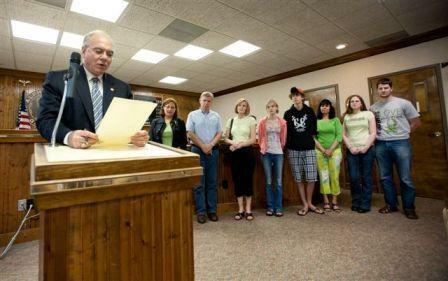 Roswell Mayor Jere Wood holds the Lyme Disease Awareness month proclamation. He discussed the issue with patients and volunteers. Support group: Thanks to guest speakers Charles Parry and Susan Sutphin who presented during the May 4th Roswell support group meeting. Radio Appearance: On Saturday, May 15, Georgia Lyme volunteers Norman and Jackie Morgan appeared on the Walter Reeves show on location at Pike’s Nursery in Peachtree City. The two were on hand to discuss Lyme disease in Georgia, answer questions, and to distribute preventative and educational pamphlets. Health Fair: On the same day, Windy Blair and Liz Schmitz hosted a Lyme and tick-borne Disease Awareness table at the New Hope Family Wellness Day in Fayetteville, Georgia. Many folks stopped by and nearly every one of them knew one or more Georgians who have contracted Lyme disease here. Thanks to everyone for sharing their stories. Television News Report: CBS Atlanta (WGCL-TV) aired a segment about the lack of Lyme disease recognition in Georgia on Thursday, May 20th. The story aired again May 21st and May 31st. 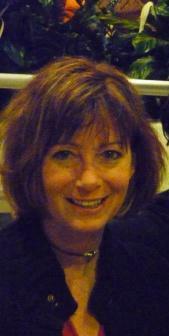 A Lyme patient first contacted the station to share her story. CBS Atlanta interviewed her, followed by several other Georgians with Lyme disease, the CDC, an Infectious Disease specialist, and Georgia Lyme Disease Association’s Liz Schmitz. Unfortunately, due to time constraints, the 20 + years of scientific evidence documenting the Lyme bacteria here was not mentioned, nor were the insensitive, unreliable tests, the controversy over “STARI”, nor the flawed reporting practices that falsely make it appear as if Lyme is not prevalent here. 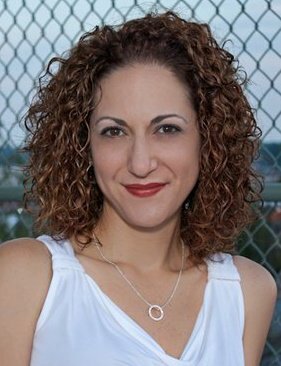 We are grateful to the kind producer Kara Pesavento, photojournalist A.J. Willen, and CBS Atlanta for caring enough about the health of our citizens to produce this report. Under Our Skin Screening: In honor of Lyme Disease Awareness Month, the Georgia Lyme Disease Association held a free screening of UNDER OUR SKIN at the Mountain View Regional Library in Marietta on Sunday, May 23. A discussion period followed the film. Afterwards, volunteers enjoyed dinner together. What a great group of folks we have working to help prevent Lyme and tick-borne diseases! Thanks to the Morgan and Jahn families for helping with the show and to Open Eye Pictures for the free wristbands and bumper stickers that were distributed to attendees. 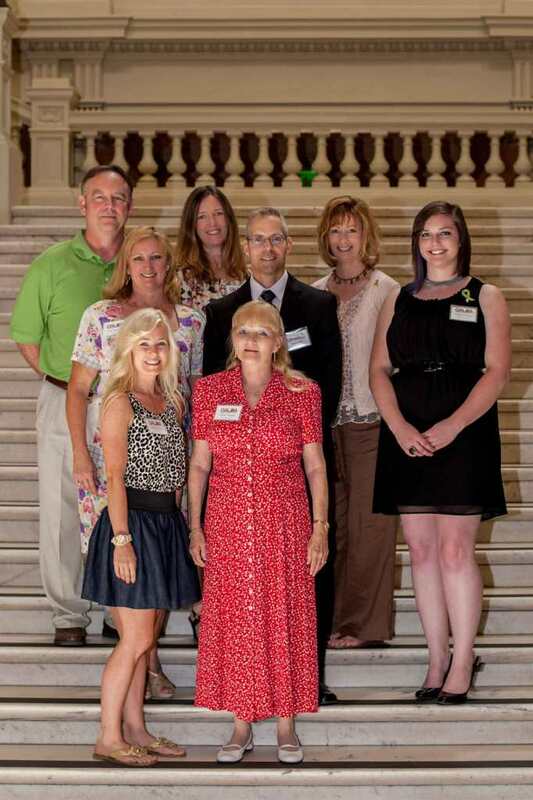 Lyme advocates and patients gathered to help with the Under Our Screen screening on May 23 in Marietta. 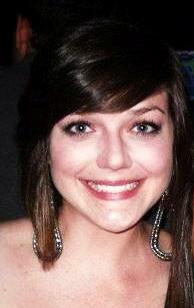 In the News: The Beacon News ran an article about Lyme disease on May 29, featuring the story of Georgia’s Chelsea Ashworth and her family. Chelsea and her brother became mysteriously ill seven years ago after playing in a pile of leaves in their yard. Thanks to Heidi Jahn and Chelsea Ashworth for their hard work on this article. Additional thanks go to: Peachtree City Mayor Don Haddix, Smyrna Mayor Arthur Max Bacon, Kennesaw Mayor Mark Mathews, Fayetteville Mayor Kenneth Steele and Mayor Pro-Tem Al Hovey-King, Alpharetta Mayor Arthur Letchas, Roswell Mayor Jere Wood, Norcross Mayor Bucky Johnson, Conyers Mayor Randal Mills, New Hope Baptist Church, Walter Reeves and WSB radio, Pike’s Nursery, CBS Atlanta, Jayeli TV, Beacon News, and all of our wonderful, dedicated volunteers. On Friday evening, April 9th, the University of North Florida held a Lyme and Tick-borne Disease Community Awareness event. 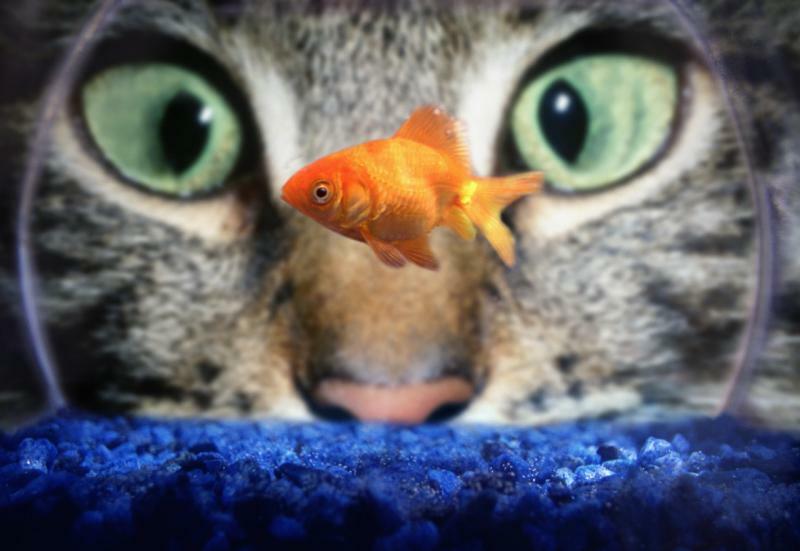 The award-winning documentary, UNDER OUR SKIN, was presented. A question and answer period followed the film. Panel members included Mandy Hughes, who was featured in the movie, southeastern Lyme patient advocates Lisa Higgins, Dane Boggs and Liz Schmitz, and Lyme and tick-borne disease researcher, UNF’s Associate Professor of Epidemiology and Environmental Health, Dr. Kerry Clark. We thank the University of North Florida and the cosponsors of this event for their efforts to educate the community about tick-borne diseases. Advocates Lisa Higgins and Michelle Brown of Tennessee and Liz Schmitz of Georgia were participants in the UNF Community Awareness event. Although in the South ticks are active year round, reports of tick bites increase significantly when warmer weather arrives. Education is the key to preventing tick-borne diseases (TBDs). On March 12 and March 19, Georgia Lyme Disease Association director Liz Schmitz presented Tick Talks for Kids to approximately 250 Braelinn Elementary School students. The 4th and 5th grade Peachtree City area residents watched a fun video, learned all sorts of information about ticks, and discussed the importance of preventative measures - including taking precautions while in wooded areas and performing tick checks at least once daily. 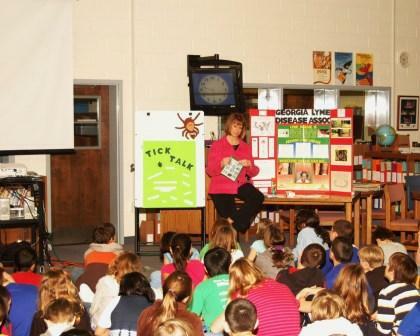 In March, we presented "Tick Talks for Kids" to Braelinn Elementary School students. The children learned that, while most tick bites may not cause disease, we can't tell by looking at them which ticks could be carrying an infection. It's important, therefore, to take preventative measures and every tick bite seriously. Special thanks go to Dr. Kerry Clark for providing the many tick specimens for the children to examine and to the national Lyme Disease Association for tick bookmarks. If you would like to schedule a Tick Talk for your school, club, or organization, please contact us. Upcoming: May is Lyme Disease Awareness month. Make plans now...what will you do to help create awareness about Lyme disease? 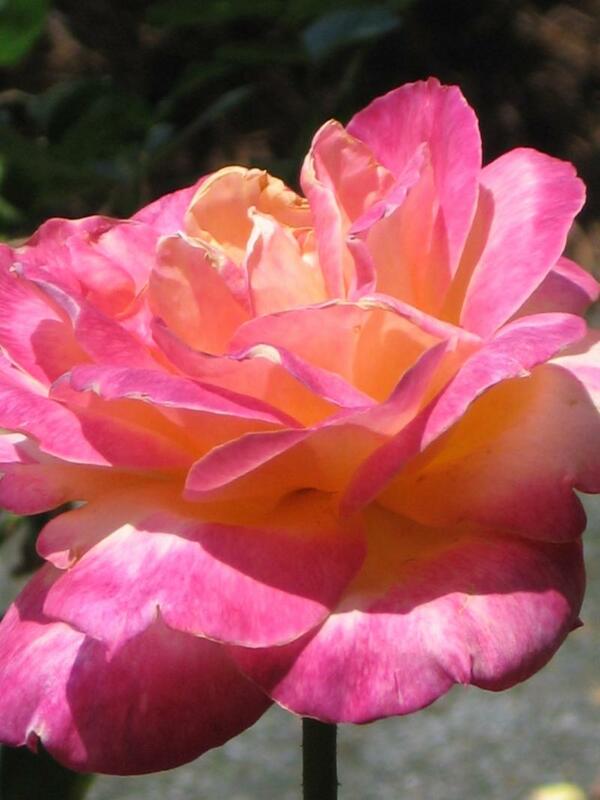 November - here at GA Lyme, a time for regrouping, reflecting, networking. A time, too, to be thankful. The Lyme conferences came and went. We were honored to be asked to write a report for the Lyme Times magazine - a review of some of the ILADS conference breakout sessions. We worked diligently to submit our contribution by the publication deadline in November. We met so many Lyme advocates from across the nation at the October Lyme and tick-borne disease conferences and followed up in November to get their input. Many shared their experiences and offered ideas such as creating a state tick-borne disease advisory committee or task force and passing legislation to ensure the accurate counting of cases. Some discussed new methods to distribute preventative and educational information. We're currently brainstorming about these great ideas. Taking the cue from the California Lyme Disease Association, we opened our Georgia Lyme Facebook page this month (and instantly gained fans-thanks!). With the help of Lyndsay Sweeney, we started to tweet on Twitter. These are great ways to stay current on Lyme scientific research and news reports. 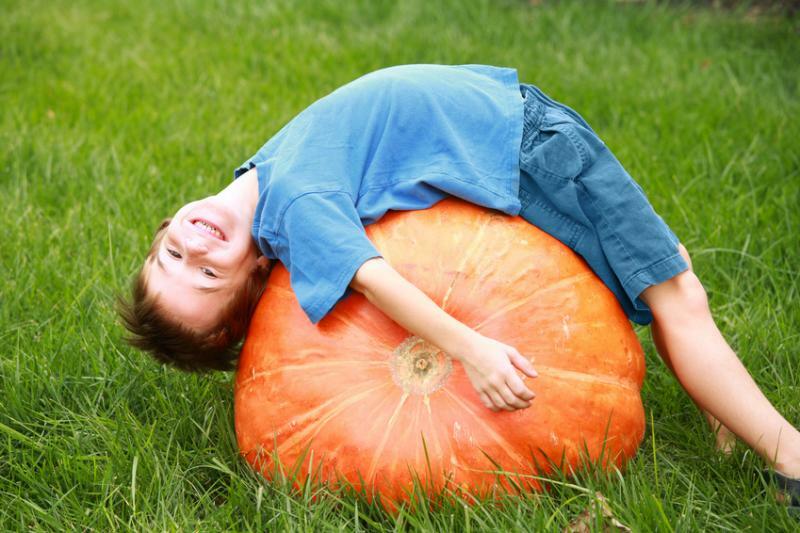 November was also a time for thankfulness. We're grateful for family, friends, food and shelter. We're so fortunate: even the poorest in our country are well off compared to others in this world. 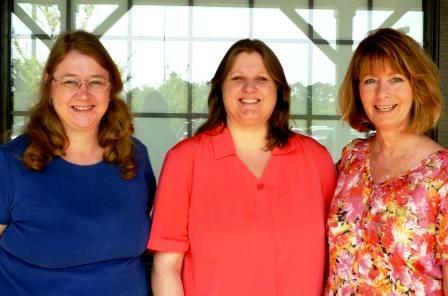 And here at Georgia Lyme, we are thankful for our wonderful advisors: Dr. Marcia Herman-Giddens, Dr. Kerry Clark and Phyllis Mervine...a team of people who are passionate about helping others. We also appreciate the wonderful Dr. David J. Volkman, those at ILADS, and everyone who stands up and speaks out for truth and justice. Thank you for caring so much about public health and suffering people. A final note: be careful out there- adult deer ticks are feeding this time of year. One of our board members found a fully engorged deer tick on her dog on Thanksgiving. Please remember to do tick checks year-round in the Southeast! Annual Lyme Disease Conferences held in Washington, D.C. This month in National Harbor, Maryland, just outside of Washington, D.C., healthcare professionals, scientists, Lyme disease patient advocates and even many patients from across the nation convened to attend several important Lyme and Tick-borne disease informational events. Read details about each conferencebelow. Lyme patient advocates Liz Schmitz of Georgia Lyme and Karen Gaudian of Ridgefield Lyme Disease Task Force attended CALDA's LYME ACTION PROGRAM. On September 3, Lyme and tick-borne disease researcher, Dr. Kerry Clark and members of the Georgia Lyme Disease Association and the Northeast Florida Lyme Association teamed up for a Lyme in the Southeast presentation before the Dougherty County Medical Society. Our sincere thanks go to Paula Bacon and Dr. Melinda Greenfield for all of their hard work in organizing the event, to the Doughterty County Medical Society for giving us the opportunity to present, and to Dr. Kerry Clark for his dedication to getting Lyme and tick-borne diseases more widely recognized in the Southeast. Retro Theater in Washington hosted the first Georgia commercial screening of the award-winning Lyme documentary, Under Our Skin in mid-July. Members of Georgia Lyme were on hand for a Q & A session about Lyme in the South following two shows. 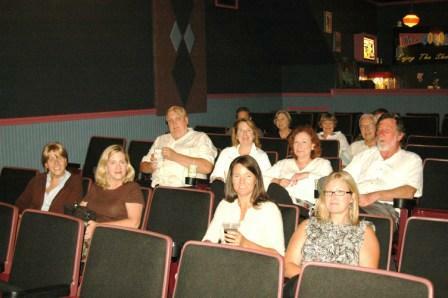 Viewers arrived early to get a good seat.Some drove many miles to see the critically acclaimed film, UNDER OUR SKIN. The boys especially enjoyed examining the Lone Star tick specimen and coming up to tell their own tick stories after the presentation. A majority of the children that shared their stories, told tales about removing ticks improperly. Additionally, after the shows, several adults in the audience reported stories involving themselves, family members or friends, all contracting Lyme disease here in Georgia. This, once again, emphasizes the need for a more aggressive tick-borne disease preventative campaign in our region. If you would like to schedule a "Tick Talk for Kids" for your school or scout group,please contact us. 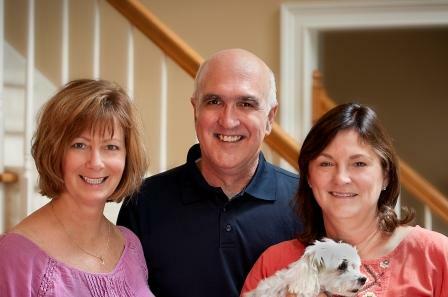 In May, a small group of members from the Georgia Lyme Disease Association and other Georgia patients met with Dr. Ben Beard and colleagues from the Centers for Disease Control of Fort Collins, CO for several hours to discuss the problem of Lyme disease in Georgia. Dr. Beard was visiting the CDC in Atlanta and we thank him for making a special effort to meet with us. Georgia Lyme Disease Association members emerged with a clear understanding that more funding to investigate and study our southeastern Lyme disease cases is needed.We hope to meet again to hold further discussions in the near future.